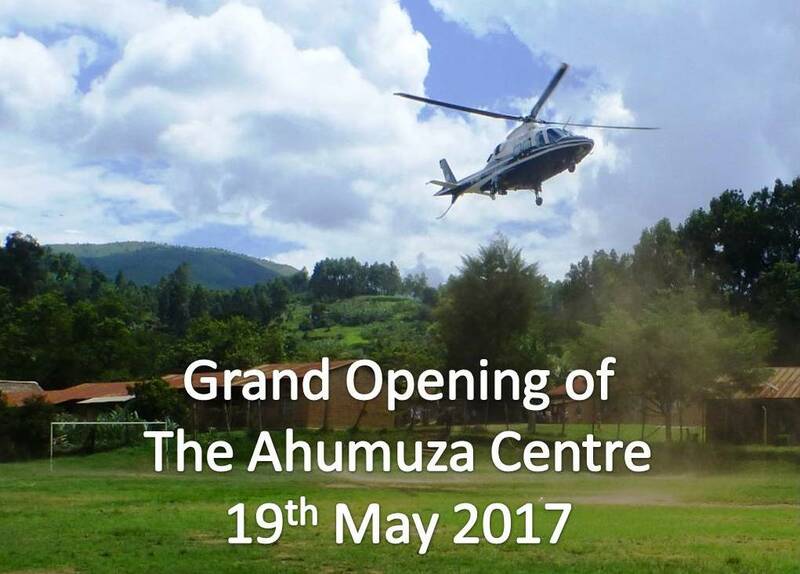 There was great excitement on the playing fields of Kisiizi Hospital Primary School as the Guest of Honour, Dr. Diana Atwiine, the Permanent Secretary of the Ministry of Health, arrived by helicopter for the Grand Opening of the new purpose-built Ahumuza Centre for patients with mental illness. 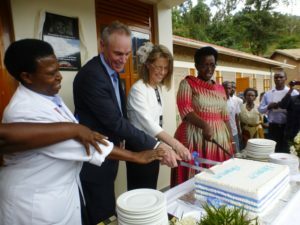 After a hymn of celebration and a prayer of dedication by Bishop Patrick Tugume, recently retired Bishop of North Kigezi, plaques were unveiled to commemorate the day and to remember the life of Jamie Devaney in whose memory the new Ahumuza Centre was built. A ribbon was cut and the VIP guests toured the Centre and then the Guest of Honour cut a cake with Jamie’s parents, Avril and Jim Devaney. The Guest of Honour then visited the Hydro-electricity generator, the Imaging Department with the new ultrasound machine donated by Toshiba via our friends in Chester, the Mothers’ Waiting Home and the Laboratory before returning to the Primary School Hall for the rest of the programme. This included a song of welcome by the Kisiizi primary school, a cultural dance by the Nyakishenyi Mental Health Association and a speech “A vision is born” by Dr. Lionel Mills, former Medical Superintendent who described a group going out into the community decades ago on St. Luke’s day. They had preached about the good news to the poor described by Jesus and afterwards a woman asked them if they could see her son who was confined in an out-building as he was out of control. 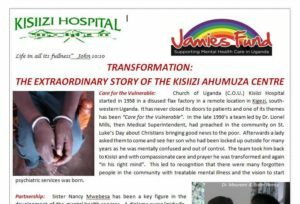 They took him back to Kisiizi and he improved with treatment and the team realised that there were many others with mental illness who needed help and the vision to establish mental health services in Kisiizi was born. 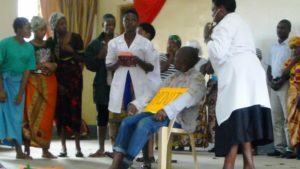 There followed a moving drama by Kisiizi staff and students depicting a patient with mental illness who fails to improve with traditional healing approaches but is restored by the Ahumuza staff team. 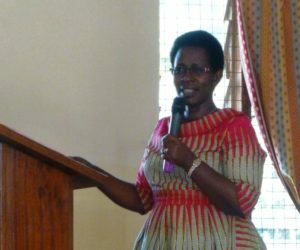 Dr. Shiela Ndyanabangi, from the Mental Health Desk at the Ministry of Health, spoke on Kisiizi Mental Health services from a national perspective with many words of great encouragement to Kisiizi and a promise of on-going full support for the programme. Rev. Hugh Burgess, Chairperson of Jamie’s Fund, spoke about the extraordinary story of the setting up of Jamie’s Fund and the support provided for a vehicle for mental health community outreaches and for the new Ahumuza Centre. The Medical Superintendent gave a presentation showing an overview of the services offered by Kisiizi with the theme “Care for the Vulnerable”. Dr. Diana Atwiine as Guest of Honour gave a heartwarming final speech praising the work being done in Kisiizi and stating it is a model for other areas and hoped the principles could be shared widely. She thanked the Staff and the members of Jamie’s Fund for all the work to achieve this great landmark and offered full support for the plans to further develop the community mental health and epilepsy services.